After installing Eclipse, the next step to do for a productive Android development is to install the sdk and plugin. This article has notes, screenshots, and thoughts on this. Installing the Android SDK is straightforward – downloading the zip file and unzipping into your favorite directory. I installed the SDK into D:\android, so all the android SDK files are installed into this long long directory: D:\android\android_sdk_windows_m3-rc20a. If you have any issues with the built-in unzip in Windows Vista, you might want to use a program like 7-Zip. The Eclipse site hints there might be some issues with unzipping into long directory names with the built-in unzip program on Windows. I used 7-Zip for both Eclipse and Android SDK and there were no problems. For all these tools to be usable, their directory (here D:\android\android_sdk_windows_m3-rc20a\tools) should be in the path. If you install the Android Plugin (below) and run these programs from there, you don’t need to add the directory to the path (you will set it up from Eclipse). This makes Eclipse a better environment for developing Android applications. The tools mentioned above will become accessible from the Eclipse environment. Creating a new Android project becomes easy. If you have worked in the Visual Studio environment, this plugin is like a template in Visual Studio. You would use, for example, a Windows Application template or ASP.NET Web Application template for creating a new project for windows or web respectively. 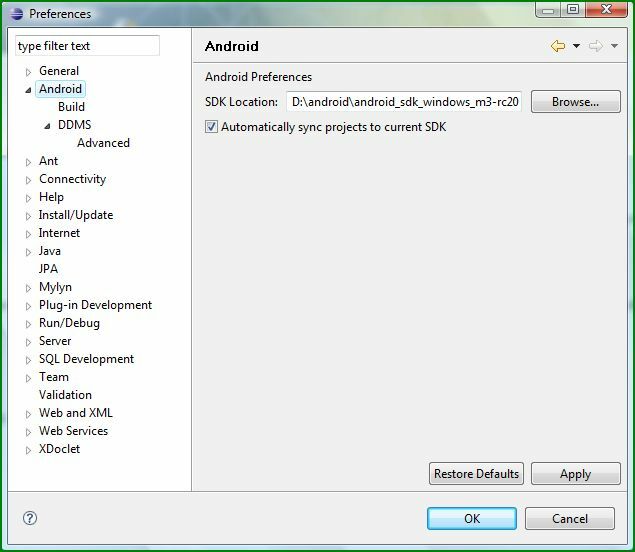 Similarly, Android plugin helps create an Android project easily from Eclipse. Unlike Eclipse or Android SDK, there are no zipped downloads for the plugin. The Eclipse environment itself provides a way to download and update the plugins from the corresponding website. As shown in Figure 1, from Eclipse use Help – Software Updates – Find and Install – Search for New Features to Install to enter the Android Plugin site details (https://dl-ssl.google.com/android/eclipse). For the latest, follow the plugin installation directions. The Figure 2 shows the Android plugin that Eclipse found at the Google site. Select the Plugin to install. There is one final thing to do to set up the Android plugin. As shown in Figure 3, from Eclipse – Window – Preferences, setup the SDK location. After setting this up, some of the tools in the Android SDK directory might access the Internet (your anti-virus program might alert you). 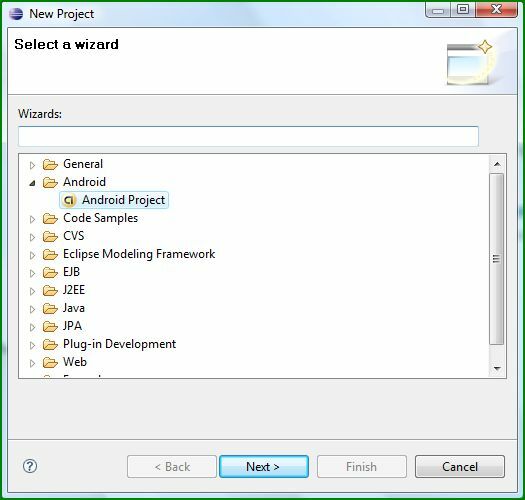 Now you are ready to create Android projects from Eclipse. As shown in Figure 4, when you choose File – New – Project, you will be shown the New Project window. Here you can choose Android Project. And finally, as shown in Figure 5, I wanted to open up the Snake sample provided in the SDK samples. 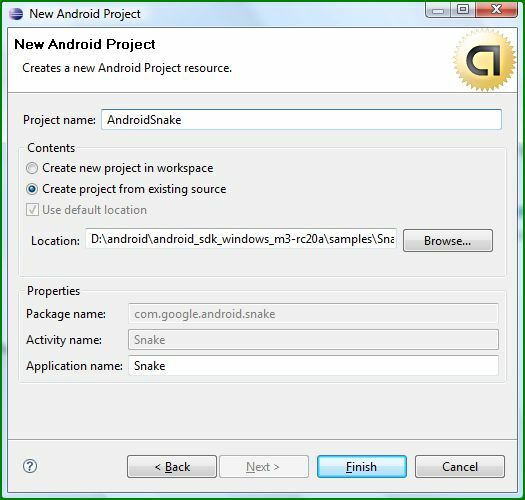 For this, choose ‘Create project from existing source’ in the New Android Project window and select the Snake directory from Samples. This will set the package name, activity name, and application name for you. In order to run this program, right-click on the newly created project (here AndroidSnake) and choose Run As – Android Application. 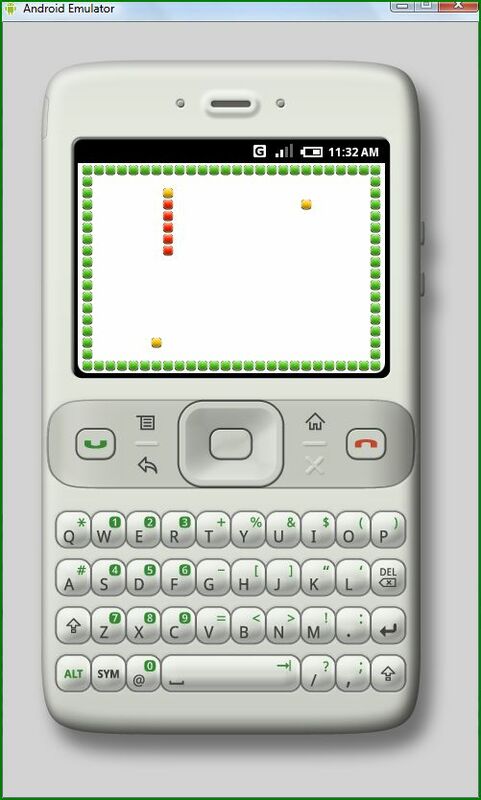 You will see the Andriod Emulator window with the snake game, as shown in Figure 6. Snake is a simple mobile phone game where the snake head eats those yellow bits on the screen (those yellow bits are called apples har har har :-). With each eating, the snake becomes longer and you need ‘skill’ and ‘agility’ to move the snake around to eat more apples.